Advantages: Almost everything you wanted to know about things the Germans dropped from airplanes from WWI to 1945. A frequent question on HyperScale usually involves the issue of the color of German bombs during WW-2. This is probably the only issue on which Wolfgang Fleischer does not go into great detail. He makes a general statement about them being dark gray, but from the picture one can see that they were also a light color; RLM 02 perhaps. Interestingly, he does note that bombs for the tropical theatre of war (presumably North Africa) were painted blue! That is the first I抳e heard of this. The book begins with a short section on the development of air-dropped weapons in WW-1, and there are some fascinating pictures and diagrams from which modelers of the period can derive some great add on detail for their models. The book continues with a discussion of the inter-war period. We come to discover that even before the rise of Nazi Germany, one of the most import tasks of the Reichswehr was the development of chemical air warfare. Under the guise of combating harmful forest parasites, experiment were carried out in delivering toxic gasses from the Junkers F 13 and W 33. The study of high explosive bombs also continued, but this time through the cooperation of the Swedish Air Force. 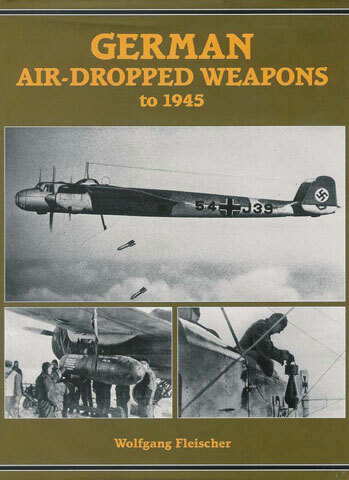 The bulk of this book deals with German air-dropped weapons during the Second World War. The author appears to use two approaches. First is the technical. This is a full description of the development of bigger and better air-dropped weapons. The second approach can be called the tactical approach. That is looking at the impact of changing tactical conditions of the war on weapons development and the impact of air-dropped weapons on the tactics of the war. With regard to the second approach, it is interesting to note that after the invasion of Poland, the Luftwaffe found that the air-dropped weapons cupboard was quite bare. An interesting explanation for Sitzkrieg perhaps, although the author does not make this conclusion. A similar situation occurred after the invasion of France. In both situations the Luftwaffe made use of Polish, Czech and French bombs and adapted them to German aircraft delivery systems. This lesson was not to be lost on the German military, for by 1941 a full 50% of the Iron and steel allocated to the Luftwaffe was to go into bombs. They would invade Russia with a full larder. Of course, the primary focus of the book is on the technical development of air-dropped weapons and the delivery systems. The author clearly delivers on this and maybe a little to much so; I抣l explain later. Mr. Fleischer provides a description and cross sectional drawing of every bomb the Luftwaffe dropped, or nearly every bomb. For those who are industrious, you can even model the fuses used to detonate the bombs, for there are schematics and cross sectional diagrams of these also. We learn some tidbits along the way. For example, the ring around the nose of some bombs was used to prevent the bomb from ricocheting when dropped on water. The opposite of what Barnes Wallis tired to accomplish. Speaking of Dam Busters, the Germans had their own version, but sort of in reverse. We are also provided with diagrams and pictures of the vertical bomb cells used in the He 111 and Ju 52. There are also various diagrams and picture of the racks used on fighter bombers. For the modeler who wants to add that extra detail, these are invaluable. The book does not stop with the description of German air-dropped weapons and how they are delivered, Mr. Fleischer goes on to describe the chemical composition of toxic chemical and explosive bomb fillings. Did you know that Sarin (T-144) was named after four chemists and that it is made up of seven chemical, but can be made with as little as five, which is called Sarin-2? Then there is Soman, which was reported to be the most toxic of all substances up to 1945; 10 times more lethal than Sarin when breathed. You also can find out the chemicals and proportions of each that make up such explosives as Ammonal DJ and Trialen 105. But, you抣l have to buy the book if you want these recipes and many more. This is a fascinating book and will be of interest not only to modelers, but also to military historians and those who are interested in the technology of warfare. I have only one concern. I realize that this is the age of information and everything you need to make a bomb is probably on the internet already, but one could look at this book and see it as a 揾ow to�, albeit using WW-2 technology. All the wiring diagrams for various types of fuses are there, as are the chemical composition of toxins and explosives. Maybe it is because of the times we live in that the final chapters makes me feel a bit queasy. Recommended with the above reservation.